On February 23, 1945, a group of United States Marines and a Navy corpsman created one of the most iconic images of World War II. During the Battle of Iwo Jima, they ascended to the top of Mount Suribachi on the South Pacific Island and raised an American flag. The photograph not only won a Pulitzer Prize for Associated Press photographer Joe Rosenthal, it also became the model for the larger-than-life size U.S. Marine Corps War Memorial in Washington. Thirty-one years after the raising of the flag on Iwo Jima and during the celebration of America's Bicentennial, the Madison Scouts re-created the photograph at the end of the corps' opener, "The Stars and Stripes Forever." 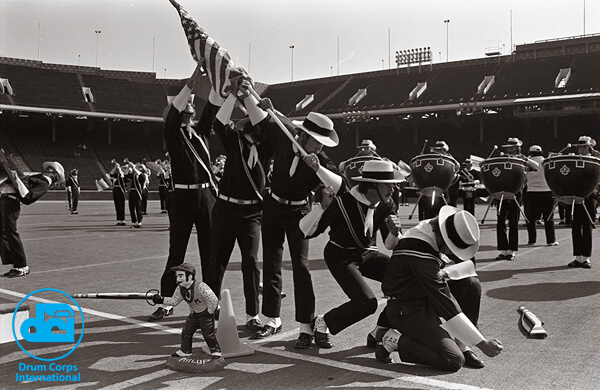 The corps is seen here at the DCI World Championship Prelims, Aug. 20, 1976, in Philadelphia. Drum Corps International wishes you a safe and pleasant Memorial Day weekend, while taking time to remember all those who have and are currently serving in the United States Armed Forces.